Easy, nutritious, and potentially gluten free, these are my favorite everyday snacks. 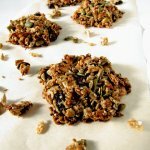 I make a batch nearly every weekend for snacking at work and home. Stir the seeds, oats, salt, honey and oil together (plus optional dried fruit), being sure to fully coat oats with the oil and honey. Spoon onto the lined baking sheet, about 2 tablespoons each. Push loose seeds and oats into the blobs, then press lightly to hold together. Cool completely before removing from baking sheet.